Can a Felon Become a Gunsmith? After their release from prison, felons find it challenging to get a job. They may think no one will hire them, but there are resources for them. Many employers have learned that felons make good employees, although most felons will have to be willing to learn a new trade or start a different career. 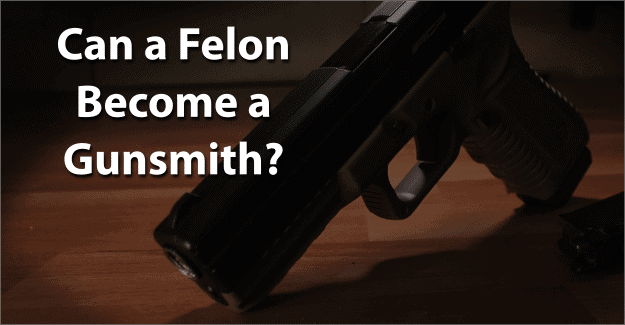 This blog post will address the issue of whether or not a felon can become a gunsmith. What Education/Training Does a Gunsmith Need? How Much Does a Gunsmith Earn? A gunsmith repairs, modifies, designs, or builds guns. A gunsmith makes modifications and alterations for special uses. A gunsmith may also apply carvings, engravings, and other features to a gun. A gunsmith typically works in a workshop and may utilize tools such as lathes, saws, drills, and presses to create, repair, or maintain firearms. Safety procedures and test firing are also part of a gunsmith’s job. Some gunsmiths may train on the job or through an apprenticeship. There are also formal training programs available. Many community colleges and technical schools offer an associate’s degree or certification. These programs typically take two years to complete and train students for entry-level gunsmith jobs. Some online training is now available for gunsmiths. Students may also take training provided by a professional organization. Degree or certification programs focus on mechanical and tooling skills required to repair and build firearms. To work as a gunsmith, a Federal Firearms License (FFL) is required. The Bureau of Alcohol, Tobacco, Firearms, and Explosives (ATF) is the agency responsible for issuing a Federal Firearms License. This does not authorize anyone to carry a gun. It only authorizes the sale, maintenance, and/or repair of them. An application and an interview with a local ATF operations investigator are also mandatory in order to qualify for this license. The U.S. Bureau of Labor Statistics indicates that there are approximately 15,600 gunsmiths in the U.S. This occupation is expected to show a 9% growth by 2024, which is slightly above average for most professions. The median salary of a gunsmith in 2014 was $30,000 annually. This is the salary at which half of gunsmiths earned more and half earned less. Experience will make a difference in how much a gunsmith earns annually. The area of the country in which a gunsmith works also makes a difference in the earnings. A gunsmith on the East or West coast typically earns more than a gunsmith working elsewhere. There are federal restrictions against felons owning a firearm. They are also prohibited from working with or dealing with firearms in any capacity, including being a gunsmith. It is important to be honest in filling out an application for training as a gunsmith. A felony that isn’t disclosed but is found on a background check constitutes fraud, a punishable crime. It is essential for felons to be honest about their background. They are already working with negative perceptions of being dishonest, untrustworthy, and unwilling or unable to follow directions from authority figures. Having their felony expunged can give them the chance they need to begin with a clean record and succeed in becoming a gunsmith. Expunging a criminal record allows anyone to honestly state on an application that he or she has not been convicted of a crime. It is a big challenge, but it might be worth it if a felon wants to become a gunsmith. Giving him or herself the best chance for success by having his or her record expunged and also documenting any programs, education, or additional training completed could be critical. Having support from family, friends, or previous employers can make a huge difference. A felon doesn’t have to be defined by his or her crime. An individual isn’t defined by their mistakes but by how he or she recovers from them. He or she can begin again and live an honest life no matter how difficult it might seem. What do you think about this blog post? Are you or someone you know been in the situation of trying to become a gunsmith with a felony? What was that like for them, and how did they achieve success? Please tell us in the comments below.